Ravi Jayagopal is the cofounder and codeveloper of Digital Access Pass (lovingly called DAP by most users). He and his bride, Veena Prashanth, built DAP to become the premier membership plugin and marketing platform for WordPress. He is a WordPress enthusiast and started blogging with WordPress back in 2004. In 2007 he wrote his first book, No Business Like E-Business. In 2000 Ravi and his family moved from India to New York in search of bigger things. In 2001 he built his first set of scripts which included the first PayPal and ClickBank download protectors and is what set him on the path to where he is today. 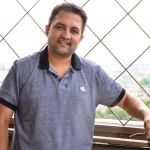 Ravi is also behind the Cool Cast Player, a beautiful podcast and audio player for your website and Subscribe Me, his podcast about membership sites, online courses, recurring subscriptions, and online business.